Returns and Exchanges for purchases from MadeInAmericaStore.com will be accepted within 30 days of the ship date. Returns and Exchanges for garments purchased from MadeInAmericaStore.com cannot be processed at the Made in America Store or any department store affiliates. 1. 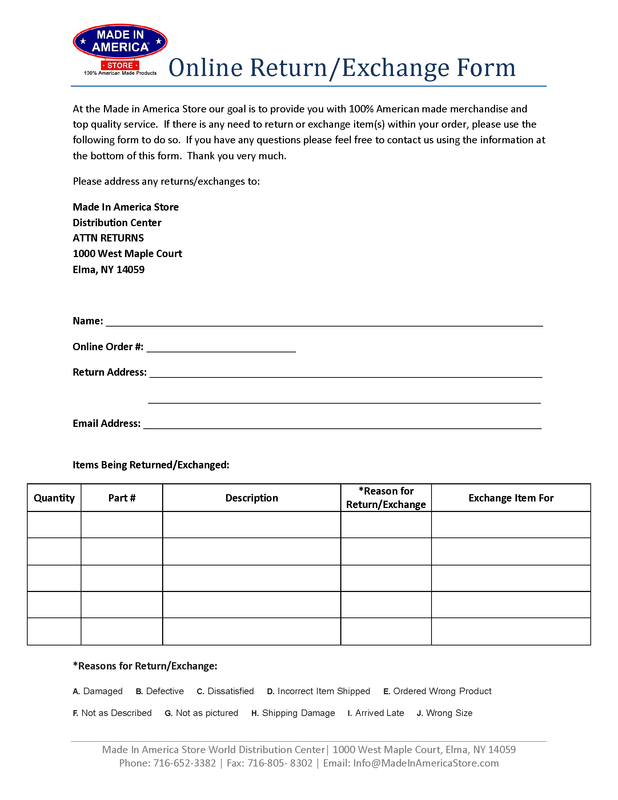 Completely fill out the return/exchange form below and return it with your merchandise. 2. The merchandise must be in New condition, meaning that the garment has not been worn, altered, damaged, and/or washed. 3. If any, all tags should be attached. 2. Refunds for items returned within 30 days will be in the same form as the original payment type. 3. No exchanges or returns will be accepted after the allotted 30-day time frame. 4. If you have an exchange that is of the same dollar amount as your original purchase, no additional shipping or handling fees will be charged.